Last Reduction in numbers is acceptable 15 day prior to arrival. Downtown Boutique Hostel is located in the heart of the old city of Zadar, declared the most desirable European destination by choice of European Best Destinations portal readers, in front of European top destinations such as Paris, Rome, London, Madrid and others. Furthermore, the Church of the Saint Donatus from 9th Century and the Roman Forum are located only two hundred yards from our hostel. Designed as a modern hostel and decorated as a 5-star hotel, Downtown Boutique Hostel is, thanks to its smart rooms, the ideal choice for guests of all ages. 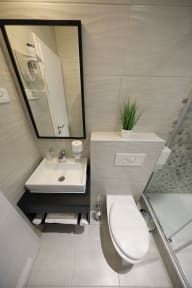 Apart from the rich and modern rooms of all sizes, guests can use private or shared bathrooms and enjoy a variety of additional services. Cancellation policy: 72 hour before arrival. Taxes not included - occupancy tax 1,35 EUR per person per night. *Only in Superior double or twin rooms and in Standard double room.